In a fresh new children’s book, we revisit America through the eyes of a new immigrant, a young girl who has also lost both her parents. The sights and sounds of New York at the turn of the century come alive as we meet immigrants from China, Eastern Europe, Ireland, and more. You can almost smell the smells and hear the cacophony of languages as this children’s book leads us through the lives of a varied cast of characters. 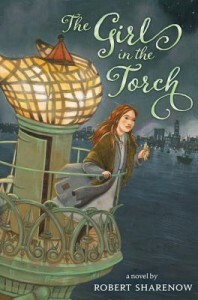 At the heart of the story is one very brave, kind, and daring young girl, who hides in the Statue of Liberty, before finding her way to New York City proper. We also encounter the reality of America, the “golden land” as it contrasts with the image that immigrants held of it before arriving. I love historical fiction, especially when it is well written and has some twists and turns. This book certainly has all of that, as Sarah illegally enters the country. We never know until the end what will happen to her. The end is particularly satisfying and unexpected. I highly recommend this children’s book for any family that has immigrant heritage. I also think it would be lovely in a classroom setting, studying immigration or studying American history. Well written, excellent characters, and a lot of good factual detail as well.